The eagle-eyed amongst you will have noticed that last week, I added the word 'baseball' to the logo at the top of this blog. 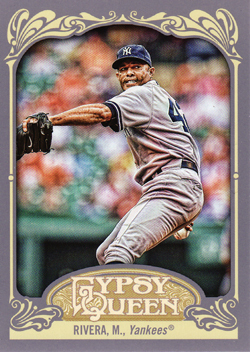 With the NBA close season upon us, I have found myself turning to 'The Boys of Summer' and have recently decided to add some baseball cards to my collection. 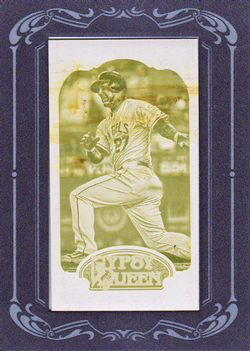 Having done a little research, I decided that the 2012 Gypsy Queen release fitted the bill and I ordered a box to break open. Below are the results. The 24 pack box delivered 60% (180 cards) of the 300 card base set, with an additional five out of a possible 50 short printed versions, with the most valuable being of Mariners Pitcher, Ichiro. When you consider the SP cards have a 1:6, I can have no complaints with the number I received. I have read a few comments from collectors expressing disquiet over the grey border from this release. Personally, I think it works sand along with excellent design on the back, it makes for a great looking base set. 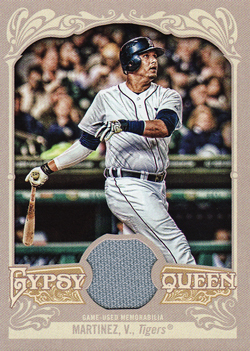 Of the 34 mini cards received, two were Sepia parallel versions (serial #'d to 99) of Adrubal Cabrera and James McDonald, whereas Ken Griffey & Alex Rodriguez turned up in the Black version. With only 20 of the 350 card base mini set, pulled from the box, completing the base set is going to be quite an undertaking, before even starting on the short prints and various parallel versions that are available to set collectors! 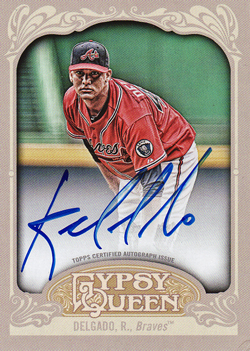 The two autograph cards I pulled were 'common' ones of Nationals Second Baseman, Danny Espinosa and Braves Pitcher, Randall Delgado. I have got to admit, I am a sucker for strong on-card autograph sets and these certainly fit the bill. 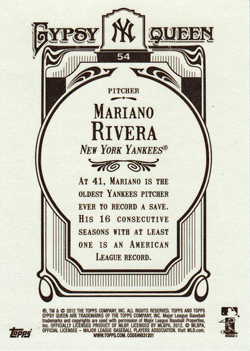 I have already purchased a couple more on eBay and there is little doubt I will chase this 40-card set. Whilst I am a fan of the autograph cards, I am less enamoured by the relic ones. 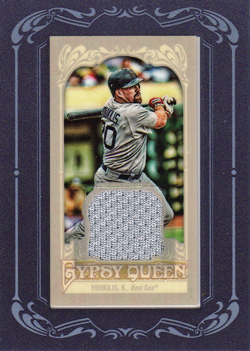 But, that has more to do with my general dislike for jersey / memorabilia cards in general, than these in particular. So it is likely that I will let these particular be traded at some pint in the future. 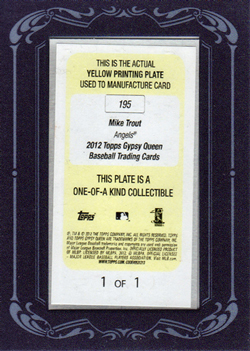 Last, but by no means least is a 1 of 1 printing plate of a rising star Mike Trout. Nine home runs, 33 RBI, a very impressive .339 batting average, culminating in a trip to the 83rd All-Star game is a pretty good way to start your rookie season! 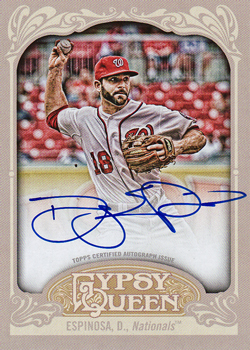 So as you can imagine to see this arrive in my first every baseball box break was pleasing to say the very least!!!! I have started to list my wants from this release here and would love to here from other collectors who have cards from this release for sale.